Gorgeous, never thought about it like that! I love the Lim bag so much though. I love everything about this outfit, your skirt is perfection, the sweater is so cute, and that bag..... it's amazing!! Oh my goodness the color on that bag is gorgeous! You look absolutely gorgeous! I love the skirt and the bag! Gorgeous! I wore similar gloves today in my post! Such a lovely, chic outfit. I really love the effect of everything together. Very modern Audrey Hepburn! You've got such good taste. I don't know how people put together such great outfits. You've thought of everything! The earring is adorable. I only just discovered Kendra Scott the other month. Really cool and affordable jewelry. Cannot find one thing about this look I don't like! Particularly obsessed with the bag! Love love love! Such a cute winter outfit! Such a cute turtleneck! Love it! i love this :) your blog is wonderful! 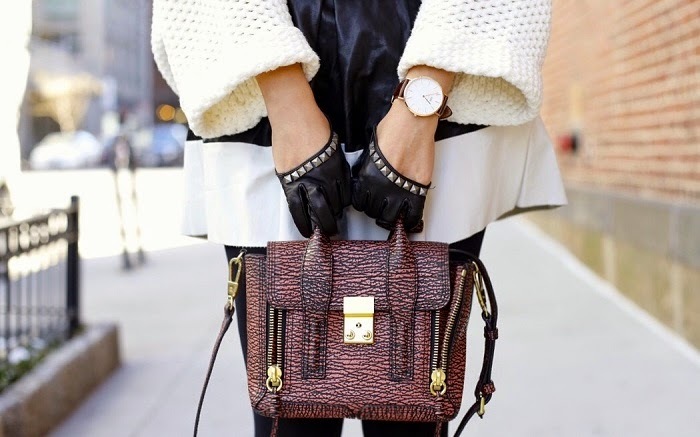 Fabulous watch, I love this look! Love this Lim bag. It really is a classic worth the investment.